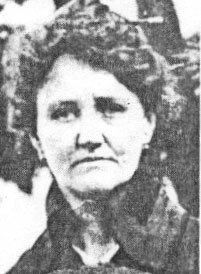 I was born in Woods Cross, Utah on August 22, 1875, the daughter of John Quincy Leavitt and Cynthia Tryphenia Elmer. I was christened Melinda Fidella Leavitt, which I chose to shorten to Delia. I was baptized by John Cattom and confirmed by John Lamox. My childhood memories of our home in Woods Cross were pleasant ones and also of our home in Salt Lake City. We lived just below the Union Pacific Station. Our home there had high windows, many trees in the front, and a white picket fence. I well remember my brother John Leavitt playing marbles on the front walk with George Albert Smith. I was allowed to watch if I promised to keep out of the way of the marbles. I especially remember conference time, in Salt Lake City, as the people came from the Railroad Station to attend. They all carried their lunch in boxes and sacks. It was good fun to watch the long b locks of stone being carried from Big cottonwood Canyon to be used to build the temple. Our close neighbors were the Abram Hatch family whom we enjoyed very much. When I was 16 years old I began my work in the church. I was asked by the Y.L.M.I.A. of the 16th Ward to take a course of study offered by the church. This course included Church History, Theology and Health studies. Our teachers were Dr. James Talmage, Professor Willard Done, and Joshua H. Paul. My school friend May Watson and I attended together and were set apart for this work. We were grateful for the experience and happy to have the privilege of teaching it to the Mutual groups. I was often asked to teach Sunday School and be active with the young people when needed. I continued this work until my marriage. Bishop George R. Emery gave me my recommend to the Salt Lake Temple and I was married to Brigham Marriott on June 30, 1897. Not long afteer this we moved to Evanston, Wyoming as Brigham found employment there. We were made welcome into the wards and enjoyed the people there. Brigham was asked to join the Mutual Board. He took part in Dramatics, joined a Mandolin Club, and was active as a ward member and teacher. Not long after our marriage, Brigham's mother Teresa Marriott, came from Ogden and made her home with us for a while. Brigham's sister, Lyle moved to Evanston with the family. It soon became evident that my health was not good in Evanston. The doctor said the altitude was too high for me. When my father learned of this he urged us to move back to Utah. We moved to Garland grateful. We attended the course at the B.Y.U. Our teachers were Brother Talmage, Hugh B. Brown, and Karl G. Maser. The result of this work was set into action as soon as possible, where it was needed in all of the wards. Many children had medical care they otherwise may not have had. Nutrition classes were taught along with first aid. The doctors of Garland and Tremonton gave freely of their help and advice. Dr. White, Dr. Betensen, Dr Luke and Dr. Shaffer put many professional hours into this. It was after this project that I was asked to accept the position of Secretary and Treasurer of the Bear River Stake Relief society. I put much thought into my decision as I was also visited by a member of the Utah State Legislature and was asked to consider membership in it. After thinking it over I decided in favor of the Lords work and continued with the Stake Relief Society. I enjoyed membership in the D.U.P. organization. Ladies Self Culture Club of Garland and working on civic committees. I am grateful for the opportunities I have had to take some of the Vida Fox Clawson tours, especially the one to Boston where I was able to learn of Emily Noyes, who was writing Leavitt genealogy as a hobby. I learned we were third cousins. She shred her research with us and requested our family names which she was missing. I divided my time between this work and other welfare projects given me. Employment was low at this time and many families were in need of assistance. My welfare assignments were throughout Plymouth, Portage, Elwood, Dewyville and others. About this time my mother Cynthia Leavitt passed away and was buried in the Leavitt Family plot in Farmington, Utah. She was 82. I received more genealogy from Emily Noyes, which was on the Dudley Leavitt line. When they were cleared for us, I began the temple work. I was lucky to have my two sisters, Mame Wise and Clair Wood and other family members and neighbors who could assist. Many of the Seminary students helped with the baptisms on our Leavitt and Elmer records. I am gratefule for the work Emily did and for the book she provided. We must always remember she worked for years on it. I shall always feel a bit sad because Emily asked me to explain to her the main purpose of our genealogy research. I told her in a letter what we believed and why. She replied: Cousin Della, your story of Joseph Smith is just like many people tell us who come here from the West. It sounds beautiful, but I for one believe him to be a fraud. She also said, however, if he is in the eternities, I will accept him. At this time we have a new set of Elmer reords. Mothers health failed until she was unable to do temple work, our father Brigham also suffered severe heart pains and loss of breath. During the years of 1944, Virginia and I (Grace) and my children were living in Layton. We encouraged our parents to spend some time with us which they did. It was at this time our father tool seriously ill and passed away January 20, 1944. He was buried in Ogden, Utah. Mother spent many lonely days after his death. Her final years were in residence at a Convelesent home in Salt Lake City, the home of Mr. Margaret Echols who was very kind to her. Her mind was always on the temple work she felt so important. She told us to "Do all you can, and do not forget to record it. Melinda Fidella Leavitt passed away on January 25, 1959, and was buried in Ogden beside our father Brigham. Brother Arlin, sister LaRue, baby Charles and grandmother Teresa Marriott who requested many years ago to be laid beside them. The last part of this history by Mrs. Grace Wilde, a daughter.